In an ecumenical worship service, held in the City Church in Wittenberg today, the World Communion of Reformed Churches (WCRC) and The Lutheran World Federation (LWF) signed the Wittenberg Witness, a common statement affirming their common call to continued renewal and cooperation on the occasion of the 500th anniversary of the Reformation. LWF General Secretary Rev. 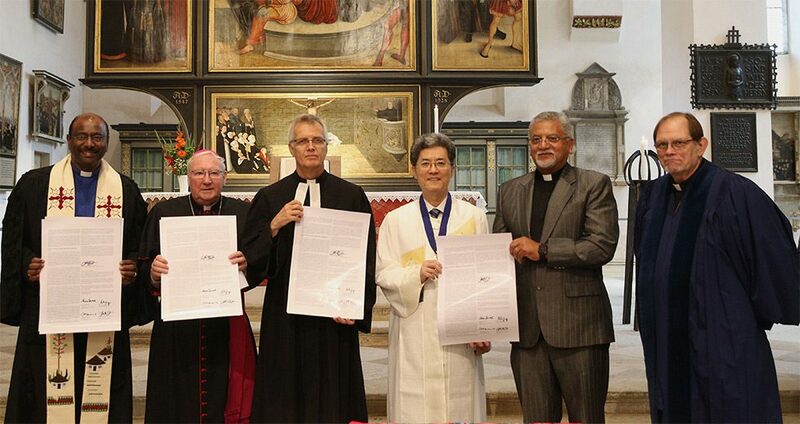 Dr. Martin Junge signed for the global Lutheran communion of 145 churches and WCRC General Secretary Rev. Dr Chris Ferguson signed for the Reformed Communion, which counts over 225 churches as members. “We approach the Reformation anniversary from the perspective of the unity of the body of Christ, which is a gift of God. This means we approach it with a spirit of ecumenical openness and accountability. The Wittenberg Witness is a testimony to this,” said LWF General Secretary Junge. The Wittenberg Witness builds on decades of theological dialogue and on steps taken by LWF and WCRC member churches around the world. It offers gratitude for the unity the churches already have in Christ, celebrates what they have in common, acknowledges and laments the still dividing issues, and expresses the common call of churches to witness in the world. In 2006 the World Methodist Council (WMC) and its member churches affirmed the fundamental agreement with the JDDJ that the mutual condemnations of the 16th century Reformation do not apply to the current teaching on justification. Today, the WCRC joins the other Christian World Communions, officially affirming that agreement while also bringing its own particular emphases to the association agreement, underscoring the integral relation between justification and justice. WCRC General Secretary Ferguson signed the statement on behalf of the Reformed Communion. The joint affirmation was also signed by the original JDDJ signatories and the parties that endorsed the agreement on justification: LWF General Secretary Junge,Secretary of the Pontifical Council for Promoting Christian Unity Bishop Brian Farrell and WMC General Secretary Bishop Ivan Abrahams.